The Star Wars franchise has been the subject of a number of excellent tabletop games. Fantasy Flight, owned by board game mega-publisher Asmodee, has produced some of the finest of these experiences. Whether your prefer card games, pen-and-paper RPGs, or strategy, there’s something to love. Some of Fantasy Flight’s most expandable and engaging experiences recreate the epic ship-to-ship battles that make the Star Wars franchise such a delightful spectacle. There are two different games available to scratch that itch. Star Wars: Armada is a game of big ships like Star Destroyers and Corellian Corvettes. The other, X-Wing, focuses on X-Wings, TIE Fighters, and a few larger ships like the Millennium Falcon and Boba Fett’s Slave-1. X-Wing recently entered its second edition, making this a perfect time to jump in with improved rules and streamlined play. Plus, if you’ve never played before, you can get started without facing an overwhelming number of ships to choose from. Our guide will help you and your family get started with X-Wing. What is a miniatures game? A tabletop miniatures game is not quite the same as a board game. Instead, this game is designed for play on any 3’ x 3’ surface. If you don’t have quite enough room for that, that’s ok, too. As long as you clearly mark the boundaries of the play space, you’re ready to go. If you’ve ever seen a game of Warhammer 40K or Warmachine, you probably also saw terrain (castle walls and other buildings, trees, and rocks) fill out a grass-colored mat upon which the game is played. Because X-Wing is played in space, the only terrain you need to worry about are the cardboard asteroid and debris tokens that come in the starter kit. 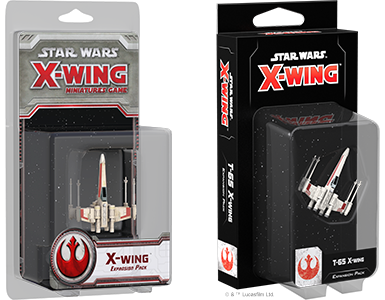 Additionally, all X-Wing ships come pre-assembled and pre-painted. While some people enjoy the model glue and paint required for many other miniatures games, X-Wing allows you to play right out of the box. This makes it a great first foray into the genre. X-Wing is a relatively inexpensive game to try. Your first stop should be the core set (MSRP $39.99). When the game entered its second edition, Fantasy Flight did some re-branding. 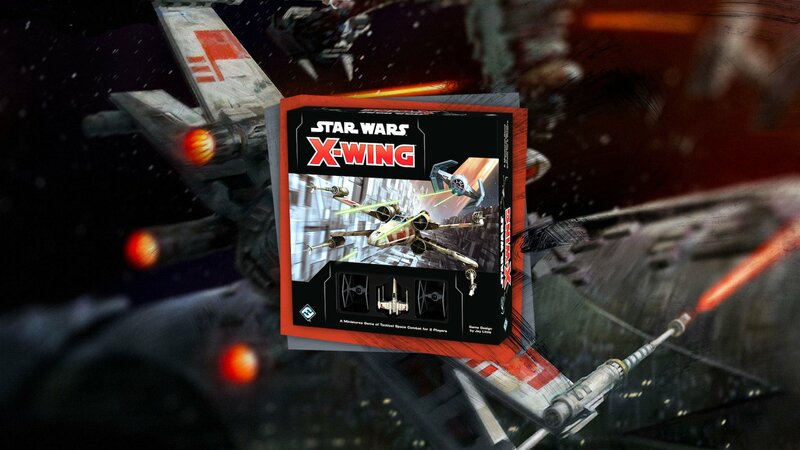 The game was previously called X-Wing Miniatures Game, but has been shortened to simply “X-Wing.” The new packaging for the core set and all expansions is black, compared to the grey color of everything related to first edition. If you purchase the first edition core set, you won’t be able to use those ships and components with other second edition ships. There are a number of first edition elements that simply aren’t compatible with second edition. On a recent trip to Barnes & Noble, we noticed that the retailer is still stocking first edition product alongside the recent second edition ships. We strongly urge you not to purchase first edition ships if you’re just getting into the hobby. All of the ships available in first edition will eventually be added to the new version, but Fantasy Flight is slowly rolling them out. I’ve played X-Wing first edition, what should I do? If you happen to have a collection of first edition ships, all is not lost! There are conversion kits for each faction (Rebellion, Empire, Scum and Villainy, Resistance, and First Order). These include ship tokens, dials, and cards to update your first edition collection to second edition. Individually, they are affordable (MSRP $29.95 - $49.95). However, if you have to purchase multiple conversion kits, it adds up quickly. For those just jumping in now, it’s not worth it to purchase first edition ships. In first edition, all point values were printed on the cards. This was convenient, but it led to significant “power creep” as each new wave was released. By the end of first edition, the original ships, like the titular X-Wings, were so underpowered that they weren’t worth playing. In second edition, values are being adjusted from time to time. A mobile and desktop app is the preferred way to build your squad. It not only reflects the most current point values for pilots and upgrades, but manages squad building rules for upgrades. Second edition also enhances a number of features and introduces The Force. Pilots like Luke Skywalker and Darth Vader can use this mystical power to change die results and power special upgrades. What comes in the Core Set? The core set is designed to give you everything you need to play a game of X-Wing, while keeping things light and approachable. To that end, you’ll only be getting three ships in the box: one X-Wing and two TIE Fighters, which is enough to learn how to play without getting overwhelmed with advanced rules. In X-Wing, each ship that you add to your squad is comprised of three core elements. A ship’s core stats include its firepower, agility, hull strength (life points), and shields. However, the pilot you choose to fly the ship matters -- some offer no additional abilities, while others add to the versatility of the ship through additional special maneuvers. Ship and pilot combinations can also be enhanced with upgrades like better shields or craftier flying for bigger bonuses while attacking and defending. The core set comes with a number of different pilot tokens for each of the ships and upgrade cards, which allows you and your opponent to experiment and customize your matches. You’ll also receive a number of tokens that correlate to the different abilities. There are a number of different kinds of cards to sort through, but for your first game, you’ll only need to worry about the pilot cards. We’ll work upgrades into the mix later. Fantasy Flight has mastered the "tutorial" process for its games, and X-Wing is no exception. We strongly recommend starting with the quickstart rules. These are designed to ease you into the different aspects of the game. Now that you have the core set, take some time to punch out the tokens, look through the cards, and familiarize yourself with the different tokens. In our next guide, we’ll walk you through setup and play of your first game with basic rules.